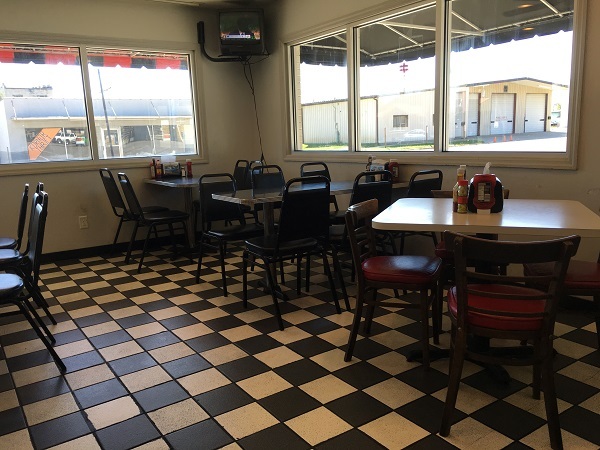 Dixie Freeze, South Pittsburg TN (take two) – Marie, Let's Eat! Last month, we revisited a great little dairy bar that serves up reliably good meat-and-two meals. It’s a bit of a drive from our house, but worth a visit if you’re in the area. The Dixie Freeze opened in 1948 and still has a walk-up window for anybody who wants a soft-serve cone or some other cute dessert, but we were there to enjoy another nice lunch. 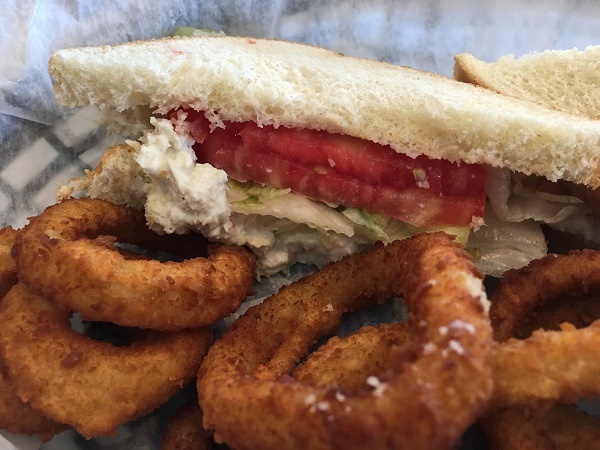 When we visited before, in 2012, we left pleased with the burger and the catfish. This time, after a very nice drive in 90 degree weather – darn near the end of September and still 90 degrees, which isn’t much different from today except the trees have prettier leaves – we arrived soon after the restaurant opened. 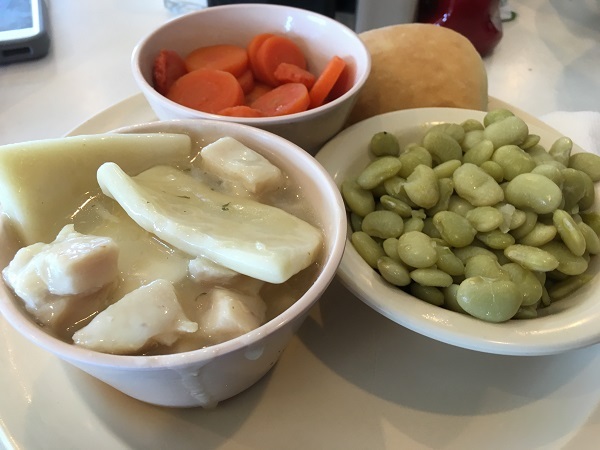 We ordered a chicken salad sandwich and the chicken and dumplings, with some carrots proving the standout among the sides. This is very good chicken salad, but to be honest, the fun surprise of my meal was a slider that I ordered on a whim and didn’t think to photograph. The next time the road brings us to South Pittsburg, I’m planning to have three or four more of these tasty little bad boys and another peanut butter malt. Our son was happy with a corn dog. 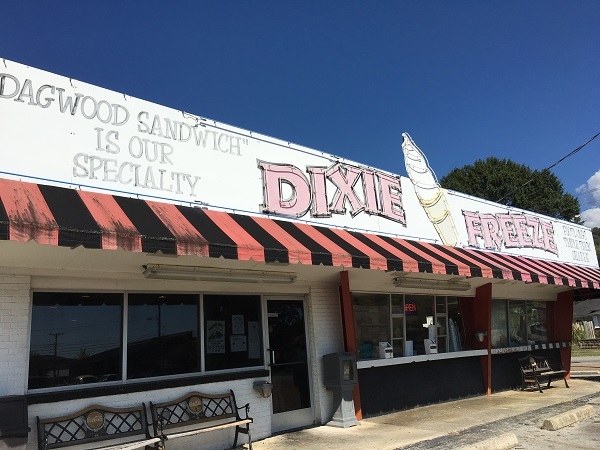 These little dairy bars may be slowly vanishing, but the Dixie Freeze has weathered well. They have wonderful employees and serve better-than-average food at a nice price. We probably won’t wait four years for our next visit. On our way back to town, we decided to celebrate my new job by taking our son on a little detour to Lookout Mountain and we rode the Incline Railway. It’s the steepest passenger railway in the entire world, reaching an absurd 72.7% grade at the top of the mountain. Apparently there have been a couple of incidents in terrible weather when the streets atop the mountain were closed with snow and ice, and pregnant moms-to-be had to use the train to get down the mountain to a waiting ambulance, which I find hilarious. It really is a neat experience, and of course the view is incredible. That was a very fun little day out; there’s nothing wrong with being a tourist at home every once in a while, you know. Posted on October 28, 2016 by Grant G.Posted in chattanooga, dairy bars, southern, tennesseeTagged chattanooga, dairy bars, south pittsburg, southern, tennessee. Did you get any cast iron at the Lodge factory? That’s S. Pittsburg’s claim to fame. Well, that and the cornbread festival that uses the Lodge pans in which to cook the cornbread. I think we’re good for cast iron, but we may visit that festival. I’ve heard it’s really fun! Next time you come to South Pittsburg, come across the street to the Pirate Drive-In! It’s been there forever and makes the best desserts. We did notice it this time – weirdly, I didn’t see it when we were here last – and I think that it would make a fun story, especially if we come on a game night for the local high school! Maybe not this fall, but possibly next year. Thanks for writing!